Former Arizona State Senator Rich Crandall, who was removed from office after he took a job as the head of the Wyoming Department of Education, may now be returning to Arizona. On Tuesday, the Wyoming Supreme Court determined that his position in Wyoming is unconstitutional. The Wyoming Supreme Court found that Wyoming’s law, Senate File 104, was unconstitutional in a 3-2 ruling. The law had been passed by the state’s Legislature at the request of Governor Mead in order to strip powers from state school Superintendent Cindy Hill. That office, one of only five statewide elected positions, included oversight of the Wyoming Department of Education. Hill was a Tea Party candidate and a thorn in the side of Mead. Crandall was removed from his senate seat by Arizona Senate President Andy Biggs due to the public’s outrage, when it was revealed by an Arizona Daily Independent reporter and Tucson radio show host James T. Harris of 104-1 The Truth FM, that Crandall pulled up a Uhaul truck to the Arizona Senate Building, packed up all of his belongings, and Tweeted a picture of the truck in front of the Capitol in a mocking farewell to his constituents. Crandall had attempted to hold onto his senate seat claiming that he needed the insurance coverage for his children. However, according to Arizona officials, Crandall could have vacated his seat so that the people in his Legislative District had representation and maintained his insurance coverage. Only after his constituents became aware of Crandall’s misrepresentations did Biggs remove him. Crandall’s companies in Arizona contracted with Arizona school districts, while he acted as Chair of the Arizona Senate Education Committee. During his tenure in the Senate, that cozy relationship was a matter of concern for many of his constituents in the state. As part of the attack on Hill, the Legislature began an investigation into her activity as Superintendent. That investigation is ongoing by a Wyoming House panel and includes claims that she misspent funds and was abusive to employees. The panel can recommend impeachment if they determine that she has engaged in wrongdoing. Hill has denied all claims against her. Hill’s supporters say that the Court’s ruling nullifies Crandall’s job. They claim that he has absolutely no authority to meet with any board or make any decisions. Hill’s legal counsel, John Masters, told KGAB that Hill had developed a transition plan, and that it was the governor’s task to deal with the current department director. Crandall is best known in Arizona for threatening a fellow lawmaker after she had discovered Crandall’s daughters tampering with his primary opponents campaign signs. A ribbon cutting, to dedicate the historical mural thanking the American Military for all their years of service, will be held by AJI Sports at their building located at 10444 East ApacheTrail Apache Junction, AZ 85120. Spread the word to any veterans that might want to attend. It will be held at 12:00 noon on Wednesday February 5th. Apache Junction is honored to have a Pearl Harbor survivor and another vet that fought on Iwo Jima in WWII. I’m asking that they jointly cut the ribbon for us. For further information, call Jeff at 602-820-4429. Delivering a strong rebuke to U.S. Sen. John McCain, Arizona Republicans passed a resolution to censure the one-time presidential nominee for what they characterize as a liberal record that has been “disastrous and harmful” to the state and nation. While McCain is a political star on the national stage, for years he has had to contend with vocal critics in his home state, who accuse him of betraying the Grand Old Party’s principles. Saturday’s censure came two weeks after the Maricopa County Republican Party passed a resolution to censure the senator on a 1,150-to-351 vote. The state GOP party’s censure passed by acclamation, meaning by a voice vote. It has no practical effect, but serves as an attempt to embarrass the senator. McCain and his office have not commented on the county censure although his supporters point to the party’s reputation for ultra-right partisanship. The senator’s office on Saturday declined comment on the state censure. McCain is considering seeking a sixth Senate term in 2016. Kyl noted that McCain has been repeatedly re-elected despite opposition over the years by many GOP activists. While many McCain allies expressed support of the senator, a wing of anti-McCain activists gathered enough support to have the resolution heard Saturday, on the floor of the state party’s annual mandatory meeting at a Tempe church. McCain’s offenses cited in the resolution included working on comprehensive immigration reform, or “amnesty,” and not going along with last year’s conservative strategy to “defund” President Obama’s signature health-care law. About 1,300 Republicans convened at the Grace Community Church in Tempe. Candidates handed out campaign swag. Committeemen voted for party leaders. And elected officials — including Gov. Jan Brewer, Rep. Matt Salmon and Sen. Andy Biggs — rallied Republicans, saying they needed work together to undo damage by the President Barack Obama’s administration. Speakers criticized the federal government’s spending, bulk collection of telephone data by the National Security Agency, and the 2012 terrorist attack that resulted in the deaths of four Americans in Benghazi, Libya. Timothy Schwartz, who authored the censure, said McCain “has abandoned us” and called on party leaders to hold him accountable. McCain always works with Democrats but not with Republicans,” Schwartz said, speaking in support of the censure. But Carole Klein, of Scottsdale, urged members to vote against the censure. She said she regrets her earlier vote in support of the county’s censure of McCain. While she is unhappy with McCain, she thinks Republicans should focus on the party’s good work. Ed Boers, 72, of Mesa, was struggling up until the last minute with how he would vote on the censure. He did not support the county’s Jan. 11 censure of McCain. Republic reporter Dan Nowicki contributed to this report. Received the below email from Jeff Serdy. He will be interviewing Agent John Dodson who let all know of the bogus Fast and Furious operation. This Saturday, the 25th from 12:00 to 2:00 Mountain time on 1100 KFNX. It steams live on the station’s website and you’ll be able to call in. We had him on last month but it was a rushed interview and I didn’t get to ask all the questions I wanted to about the fast and Furious scandal. He’ll actually be in the studio so it should be very interesting. Superstition Search and Rescue is selling tickets for a chance to win a Smith & Wesson rifle with a 16-inch barrel and 30-round magazine. Tickets cost $5 each or $20 for five. Proceeds from the raffle will help the nonprofit, all-volunteer organization purchase new equipment that members will use in local search-and-rescue operations. The drawing will take place Feb. 23 at the Apache Junction Rodeo Park Event Center, 1590 E. Lost Dutchman Blvd., during the Lost Dutchman Days Rodeo. The winner need not be present. The winner may choose an alternate cash prize of $600. 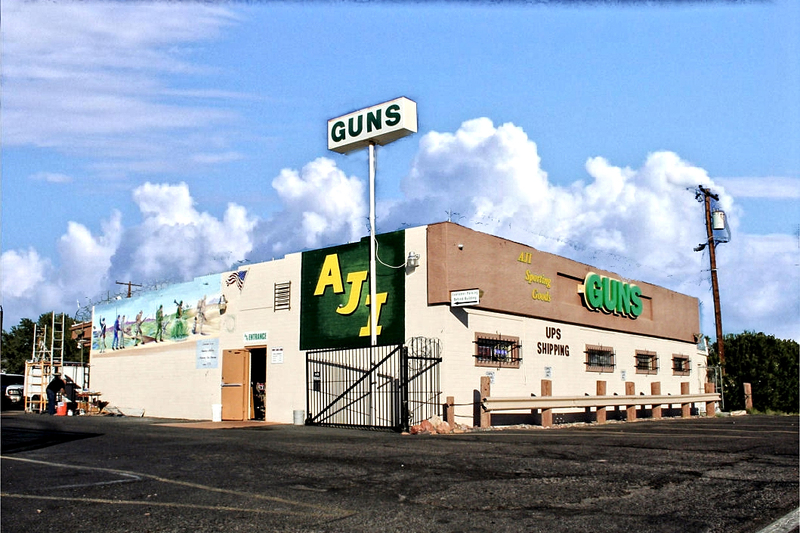 He or she must pick up the rifle from The Gun Depot, 6740 E. University Drive in Mesa. Tickets may be purchased at the Apache Junction Chamber of Commerce, 567 W. Apache Trail in Apache Junction. For more information, call 602-919-2707. Mesa is reaping the ultimate cash crop from its Pinal County farmland: cash. The city closed last week on the first part of a three-phase deal that could produce $135 million in purchase and lease payments over the next 5 1/2 years. Farm Sources International, a London company with North American headquarters in Scottsdale, is buying the property through a recently created affiliate called Pinal Land Holdings LLC. The first check, for more than $20 million, landed in Mesa’s bank account on New Year’s Eve. “It’s great to deposit a check of that size and see it actually come to fruition,” Mayor Scott Smith said. For Mesa, it’s the serendipitous end of a nearly 30-year saga involving Arizona’s fragile water supply, global food shortages and the Chicago Cubs. Spurred by a 1980 state law that required cities to prove they had enough water for future growth, Mesa paid nearly $30 million for almost 12,000 acres of Pinal farmland in 1985. Owning its water rights would allow Mesa to pull up to 30,000 acre-feet a year from the Central Arizona Project canal — enough to supply 60,000 homes. Using farmland water, the city then would pump an equal amount back into the canal as it traversed Pinal County en route to Tucson. Over the years, however, Mesa developed other sources of water, and the city netted only about $200,000 a year from leases to farmers who continued to work the land. Some people began to advocate selling the land as a way of shoring up Mesa’s chronically fragile finances. In 2007 — at the height of the last real-estate boom — Mesa hired Scottsdale broker Nathan & Associates to market the land, hoping to rake in as much as $300 million. A few relatively small tracts sold during the recession, leaving about 11,400 acres in several parcels between Coolidge and Eloy. Editor: What are the new owners plans?